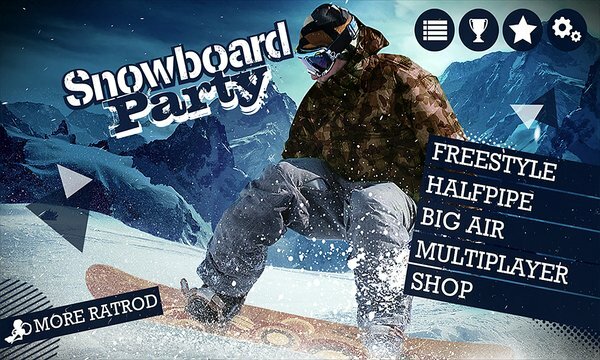 Published by Ratrod Studio Inc.
Snowboard Party brings the thrill of snowboarding to your mobile device! Get ready to ride down the slopes at extreme speed and catch some big air to perform the craziest tricks in 21 completely unique adrenaline-filled locations. Jump on your board, learn new moves and improve your snowboarding skills to land sick combos and rack high scores! Play with your friends using the new online multiplayer mode or challenge riders from all over the world using the online leaderboards. Complete over 105 level objectives, 32 achievements, gain experience and upgrade your favorite snowboarder attributes to perform better and achieve higher scores. Customize your outfit and upgrade your board to give you an extra edge over the competition. 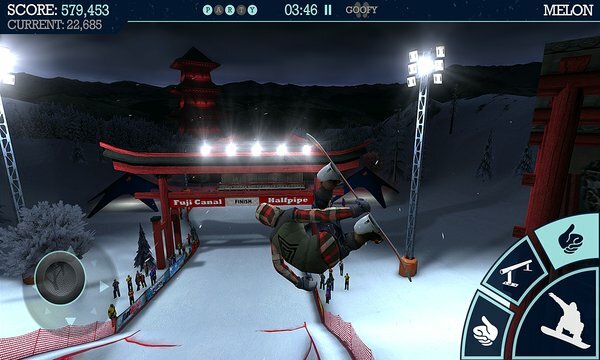 Snowboard Party includes next generation 3D graphics specially optimized for your mobile hardware to provide you with the best snowboarding experience. Freestyle is all about the tricks! The rider uses natural and man-made features such as rails, jumps, boxes, logs, rocks and innumerable other objects to perform the sickest tricks! Go big or go home! Big air competitions are contests where riders perform tricks on massive jumps while going down the slope at high speed. Perform a wide range of tricks while going down some of the world’s biggest halfpipes. Chain multiple tricks in a row to gain more points and achieve a better score. Challenge your friends to a snowboard battle and let’s see who can land the baddest tricks! Select between 15 snowboarders and customize each of them to your preference choosing your favorite gear. A massive collection of boards ranging from different sizes and designs are available allowing you to complement your rider’s skills and abilities. Over 50 unique tricks to master and hundreds of combinations. Follow the tutorial to get started and progress as you go. Execute the craziest combos and trick sequences to rack up some impressive high scores, gain experience and make a name for yourself. New fully customizable control system to configure your own button layout. Use the right or left handed control mode, select a control preset or create your own. Use the analog stick or accelerometer option as you wish.